Power Your Posing, iPhone 3G Case Comes With a Flash & Its Own Battery! This entry was posted on March 3, 2010 by Avel Ureño. 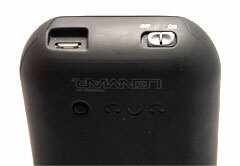 Lenmar Battery has recently come out with a cover for the iPhone 3G and iPhone 3Gs. The cover itself is a fairly standard hardened rubber sort of affair, with a couple of notable exceptions. For one it has a battery built into the case, which can be charged from an external USB source, it also addresses the lack of a flash on the iPhone. The case has a super bright LED mounted into the back of it which is turned off and on with a small button on the back, the same button is used to switch the phone from using its internal battery to making use of the external one provided in the pack. While the LED isn’t anywhere near as good as the flash you’d find on an actual camera it does provide a passable amount of illumination for close up photos. The unit sets itself apart from the others in the category by being a fully enclosed case unit in two parts, once snapped into place on the phone it has a nice seamless look and adds very little (2 oz) heft to the iPhone, though it does bulk it up a little. The battery case charges through a USB (micro) port and also has a handy three stage charge indicator light on the back of the case. I love my iPhone 3GS when I installed the V. 4 OS on. It seems a bit slicker. Me too! I just love my iPhone and at least Apple continuously does everything to rectify the problems. I would always be a huge fan of iPhones. They are the coolest gadget out there right now. Lots of awesome apps and accessories. Thanks for this suggestion, I'll get one of this cases. Cool cover, I want one of this! Kudos for Lenmar for coming up with this cover design. Wow! I don't care really if it bulks the iPhone, I'm after the feature of it. Thanks!